Uniana's Treasure Ship received an excellent response at the 2004 Australian Amusement & Vending Trade Expo in Sydney earlier this month. The Treasure Ship, a unique, colourful and easy to use redemption game, is now available through Highway Entertainment for immediate shipment. Visitors at the Australian show gave the Treasure Ship a very warm welcome - it was certainly the 'most played' machine at the Highway Entertainment booth. 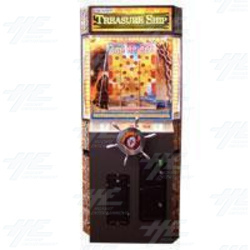 The Treasure Ship requires players to manoeuvre the ball into the machines various scoring holes by turning the ships 'steering wheel'. Points range from 10 to 70, and the game is available with ticket payout. To view the product, click this link.